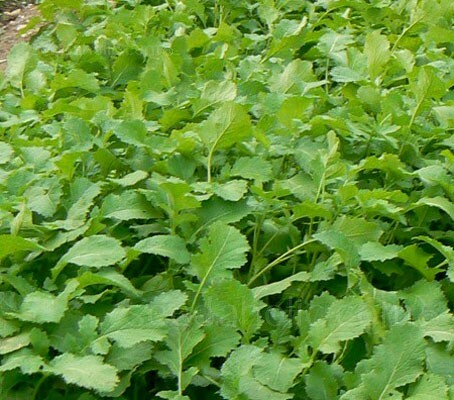 Sinapsis alba or White Mustard is a high quality Mustard variety. It is a cool season crop that can be grown in a short growing season. Ideal as a green manure, it is fast growing and produces large volumes of green matter and residual fibre which, when chopped up and dug in is particularly good for soil that lacks organic matter as it helps to improve soil texture and moisture retention. Sow early March-September at 3g/sqm. After 4 to 8 weeks of growth chop down the plants and cultivate into the top few inches of your soil. On sandy ground let mustard reach 40cm in height before digging in. This will produce more fibrous plant matter that can help very free draining soils retain more moisture and nutrients. 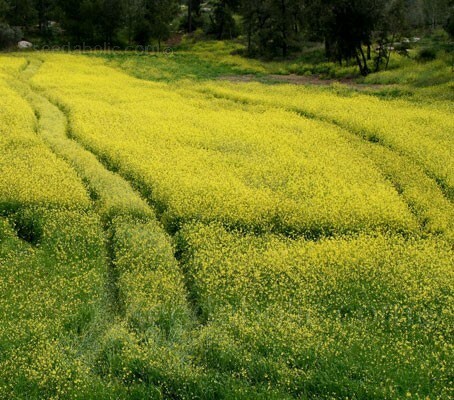 Mustard is well adapted to cool climates and will germinate at low soil temperatures to 4°C (39°F). Seedlings emerge rapidly, but then usually grow slowly. Plants cover the ground in 4 to 5 weeks. Plant height at maturity varies from 60 to 90cm (24 to 36in) depending on environmental conditions. Flower buds are visible about five weeks after emergence. 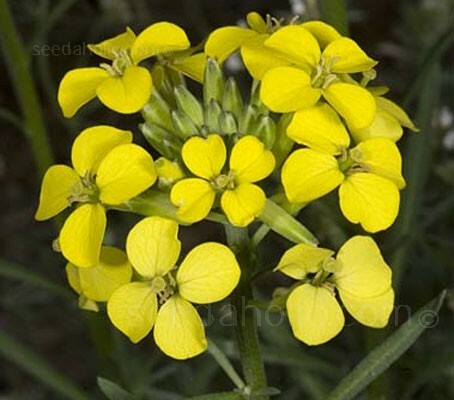 Yellow flowers begin to appear 7 to 10 days later and continue blooming for a long period. They are attractive to pollinating insects. Mustard can be raised on variable soil types; it has partial drought tolerance, but does not tolerate waterlogged soils since growth will be stunted. Mustard is a robust annual, once frosts arrive in winter the foliage can be left on the soil surface as a mulch. It will gradually be incorporated by worms etc and the remainder can be dug in during early spring. Mustards are reportedly good for companion planting, as they stimulate growth of beans, grapes and fruit trees, and are considered an excellent rotation for wheat and cereal crops. It is thought that mustard may reduce the population of wireworms by stimulating the pest to complete their life cycle much quicker - these insects can devastate a crop of potatoes. Mustard is ideal sown before planting seed potato beds. As part of the brassica family, repeated sowings and digging in of the mustard at 4 to 8 week intervals may help to clear infected land of club-root. Mustard will activate the dormant spores of this fungal disease, and will allow the grower to break its life-cycle as the plants are prematurely destroyed. An excellent plus, as club-root disease can remain dormant in the ground for up to 20 years but this is not a quick fix and it will take a number of repeated sowings. Don’t use mustard before sowing a brassica crop in crop rotation, as this increases the likelihood of diseases. Bare patches should be covered within two to three weeks and plants will do the most good if they are left for around eight weeks before digging in. If plants start to flower before this, cut off the tops and dig in. Leave the green manure to decompose in the soil for up to four weeks before growing vegetables. Rotate green manures as you would any other crop. Rotate Vicia, and Alfalfa, with Peas/Beans, Mustard and Fodder Raddish with Brassicas. Mustard (Brassica spp. ), a native to temperate regions of Europe, was one of the first domesticated crops. This crop's economic value resulted in its wide dispersal and it has been grown as a herb in Asia, North Africa, and Europe for thousands of years. Ancient Greeks and Romans enjoyed mustard (sinapis) seed as a paste and powder. In about 1300, the name "mustard" was given to the condiment made by mixing “mustum”, which is the Latin word for unfermented grape juice, with ground mustard seeds. Mustards belong to the Brassica Family. The three main types are Black Mustard (Brassica nigra), Oriental/Brown Mustard (Brassica juncea) and Yellow Mustard (Brassica hirta). In Europe Yellow Mustard is also known as Sinapis alba - an older botanical name. It is also occasionally referred to as White Mustard. Nutritionally, it adds fat, oil and protein to the diet, and is used when a milder flavouring is desired. It is used to make the standard mustards often applied to hot dogs.